Download "It s What We Do. 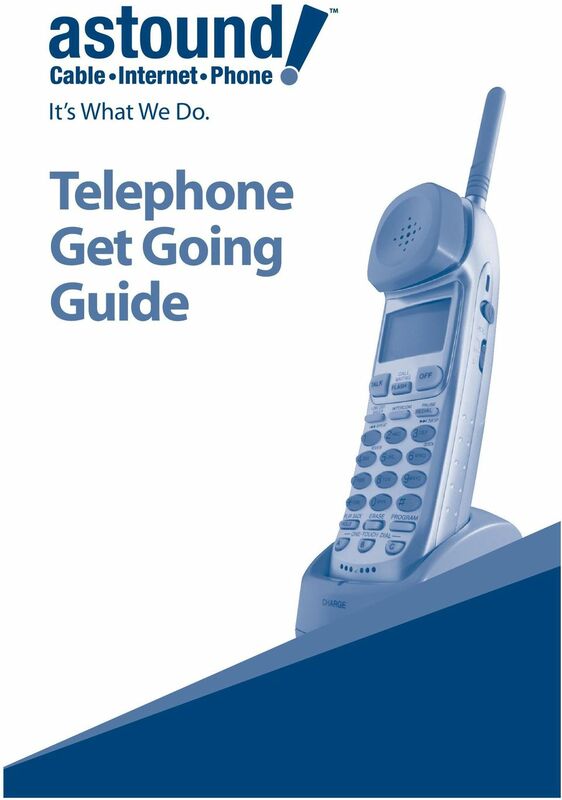 Telephone Get Going Guide"
4 Using Your Features Call Forwarding - Variable, Busy, No Answer This feature redirects incoming calls to another phone number. You can redirect all incoming calls or calls received when your phone is busy or not answered after four rings. To activate the Busy or No Answer options, advise Astound of the phone number where calls should be forwarded. Call Forwarding-Variable can be activated and deactivated by the subscriber at any time without having to contact Astound. Call Forwarding - Variable overrides all other Call Forwarding features. 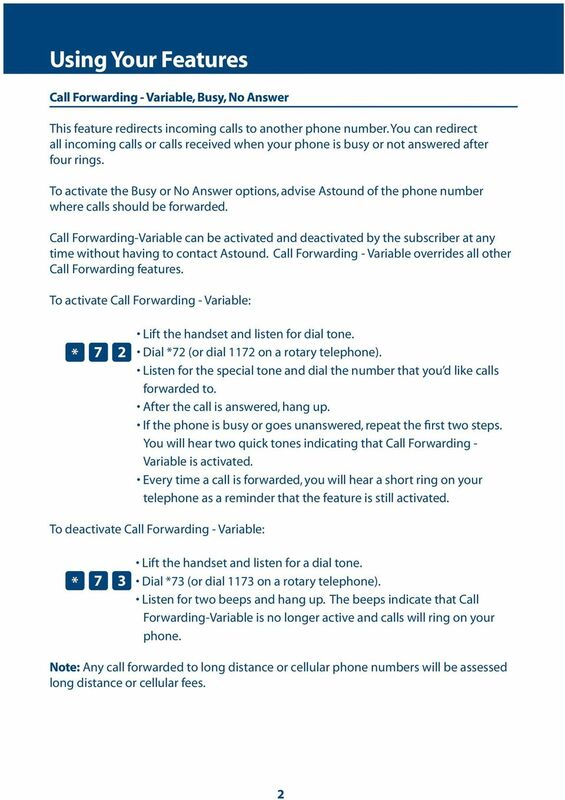 To activate Call Forwarding - Variable: * 7 2 Lift the handset and listen for dial tone. Dial *72 (or dial 1172 on a rotary telephone). Listen for the special tone and dial the number that you d like calls forwarded to. After the call is answered, hang up. If the phone is busy or goes unanswered, repeat the first two steps. You will hear two quick tones indicating that Call Forwarding - Variable is activated. Every time a call is forwarded, you will hear a short ring on your telephone as a reminder that the feature is still activated. To deactivate Call Forwarding - Variable: * 7 3 Lift the handset and listen for a dial tone. Dial *73 (or dial 1173 on a rotary telephone). Listen for two beeps and hang up. The beeps indicate that Call Forwarding-Variable is no longer active and calls will ring on your phone. 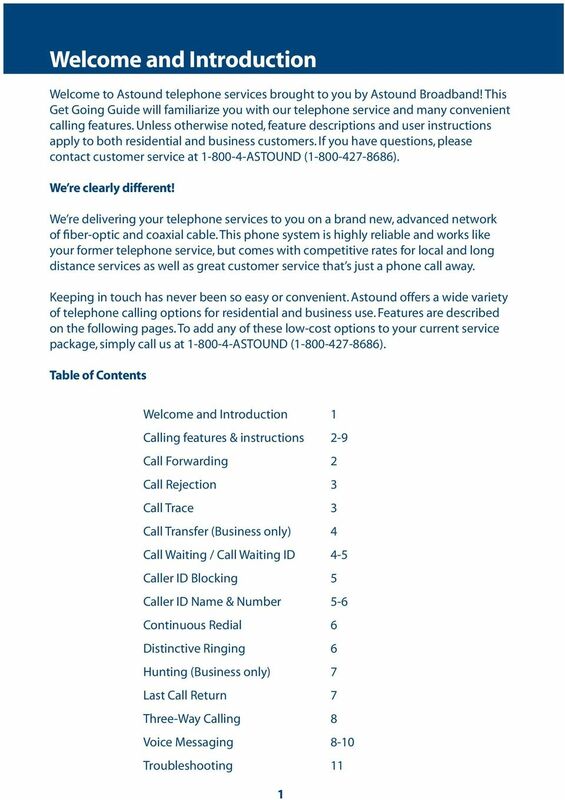 Note: Any call forwarded to long distance or cellular phone numbers will be assessed long distance or cellular fees. 5 Call Rejection This feature allows you to reject calls that have been intentionally blocked. However, if display information is unavailable due to network restrictions or for reasons other than intentional blocking, you will receive a message that indicates the call is unavailable. Rejected callers will hear an announcement from Astound instructing them to hang up, unblock their number, and redial. Call Rejection is provided free of charge when you subscribe to a Caller ID service. To activate Call Rejection: * 7 7 Lift the handset and dial *77 (or dial 1177 on a rotary telephone). To deactivate Call Rejection: * 8 7 Lift the handset and dial *87 (or dial 1187 on a rotary telephone). Call Trace In the event of an obscene or threatening call, this feature allows you to attempt to trace the telephone number of the last call received. To activate a Call Trace: * 5 7 Hang up after you have received the call. Lift the handset and listen for dial tone. Dial *57 (or dial 1157 on a rotary telephone). Follow the recorded instructions. Please call Astound Broadband ( ) within 24 hours of each successful trace to report date and time of trace. 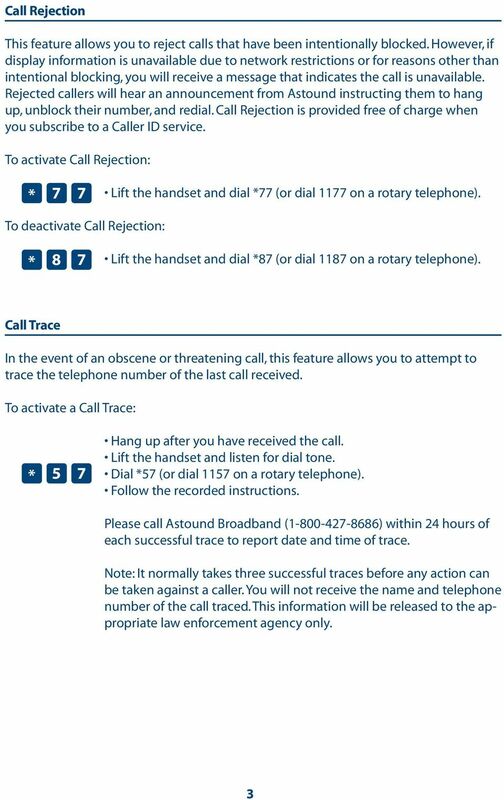 Note: It normally takes three successful traces before any action can be taken against a caller. You will not receive the name and telephone number of the call traced. This information will be released to the appropriate law enforcement agency only. 6 Call Transfer (Business Customers Only) This feature allows you to transfer an established call to another person or talk to two different people at the same time. To activate Call Transfer: Press and release the flash button, link key, or switchhook to put the call on hold. Dial the number of the party that you would like the call transferred to. When the party answers, press and release the flash button, link key, or switchhook to connect all three parties. You can talk privately with the second person before making the three-way connection. After you hang up, the call is transferred. Note: If the line is busy or goes unanswered, press the flash button, link key, or switchhook twice to cancel. You will still be connected to the first call. 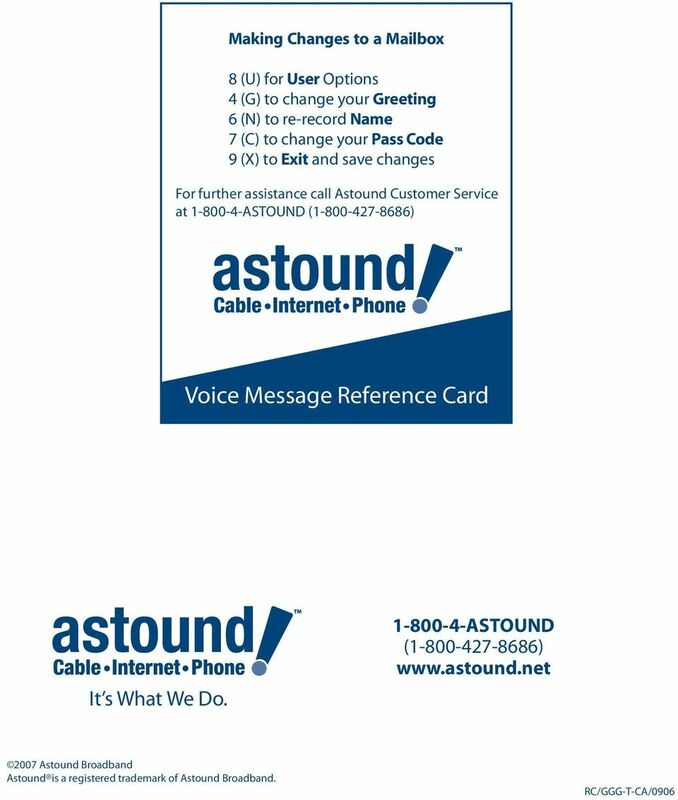 Contact your Astound representative if you re interested in Call Transfer for your business. Call Waiting / Call Waiting ID This feature alerts you of another incoming call when you re already engaged in a phone conversation. To use Call Waiting: When you are on the phone and another call comes in, you will hear a beep. After the beep, depress the flash button, link key or switchhook for one second to get the second call on the line To go back to the original call, depress the flash button, link key or switchhook again for one second. You can go back and forth as often as necessary. Note: If a third caller attempts to call when there are already two calls on the line, the third caller will go into voice mail or receive a busy signal if voice mail is not an option. 7 To cancel Call Waiting on a call-by-call basis: * 7 0 Dial *70, then dial the phone number you want to call. Callers will hear a busy signal or reach your Voice Messaging. After you hang up, Call Waiting will be reactivated. Call Waiting ID allows you to see caller ID information about an incoming call when using the Call Waiting feature. NOTE: You must have a Call Waiting ID telephone to access this feature. Caller ID Blocking There are two free options called Selective Blocking and Complete Blocking that enable you to prevent your name and telephone number from being displayed when you make a call. 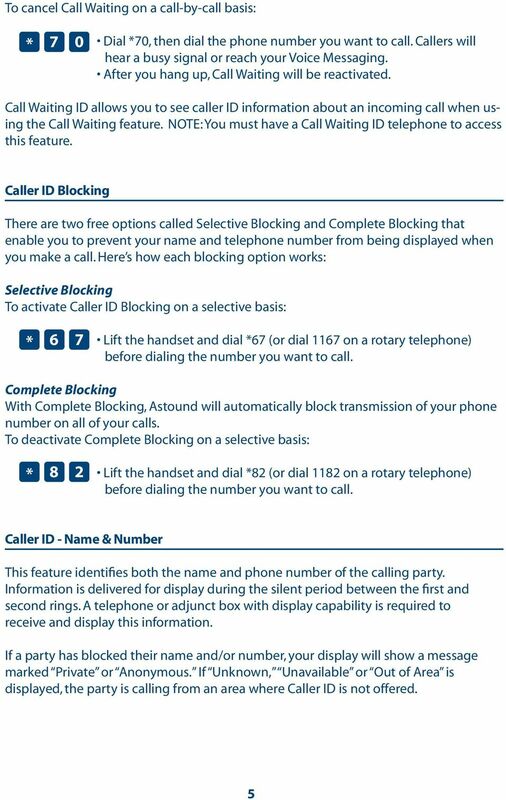 Here s how each blocking option works: Selective Blocking To activate Caller ID Blocking on a selective basis: * 6 7 Lift the handset and dial *67 (or dial 1167 on a rotary telephone) before dialing the number you want to call. Complete Blocking With Complete Blocking, Astound will automatically block transmission of your phone number on all of your calls. To deactivate Complete Blocking on a selective basis: * 8 2 Lift the handset and dial *82 (or dial 1182 on a rotary telephone) before dialing the number you want to call. Caller ID - Name & Number This feature identifies both the name and phone number of the calling party. Information is delivered for display during the silent period between the first and second rings. 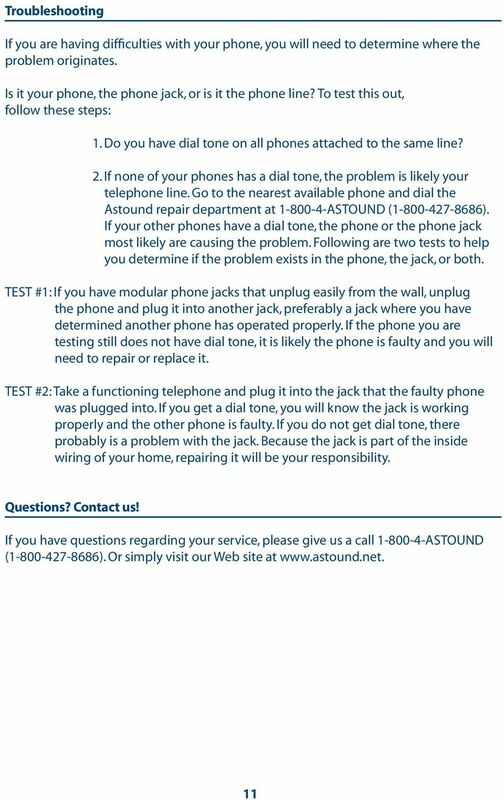 A telephone or adjunct box with display capability is required to receive and display this information. If a party has blocked their name and/or number, your display will show a message marked Private or Anonymous. If Unknown, Unavailable or Out of Area is displayed, the party is calling from an area where Caller ID is not offered. 8 Caller ID - Number Only Caller ID - Number Only identifies the ten-digit phone number of the calling party. Continuous Redial This feature continuously redials a busy phone line until the line is free up to 30 minutes. Your phone will ring when the phone line called is free. To activate Continuous Redial: * 6 6 Hang up after getting a busy signal. To activate Continuous Redial, pick up the handset again, dial *66 (or dial 1166 on a rotary telephone) and hang up. You will hear a distinctive ring when the phone line called is free. Pick up the phone and your call will be connected. Note: While Continuous Redial is activated, you can continue to place and receive calls. To deactivate Continuous Redial: * 8 6 Lift the handset and dial *86 (or dial 1186 on a rotary telephone). Distinctive Ringing Distinctive Ringing allows you to program up to 10 telephone numbers that will ring uniquely when calls come into your telephone number. To program Distinctive Ringing: * 6 1 Press *61 (1161 from a rotary phone) to activate. The automated attendant will guide you through the set up process. When a call comes in from one of the telephone numbers on your list, you will hear a distinctive ring. 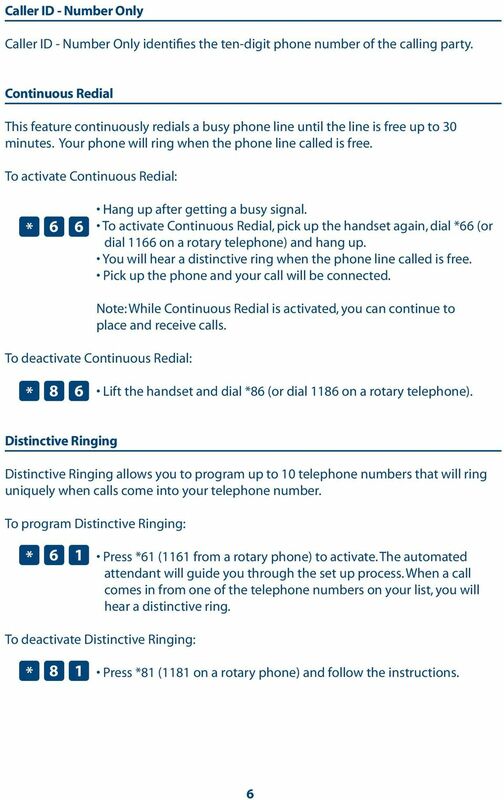 To deactivate Distinctive Ringing: * 8 1 Press *81 (1181 on a rotary phone) and follow the instructions. 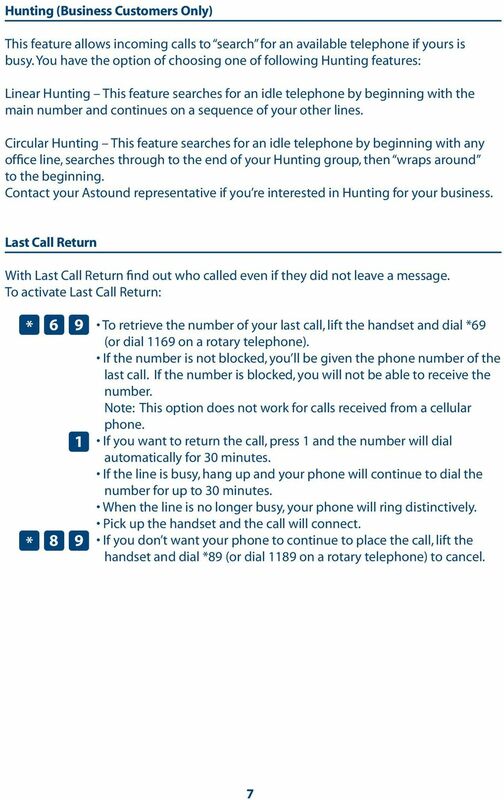 9 Hunting (Business Customers Only) This feature allows incoming calls to search for an available telephone if yours is busy. You have the option of choosing one of following Hunting features: Linear Hunting This feature searches for an idle telephone by beginning with the main number and continues on a sequence of your other lines. Circular Hunting This feature searches for an idle telephone by beginning with any office line, searches through to the end of your Hunting group, then wraps around to the beginning. Contact your Astound representative if you re interested in Hunting for your business. Last Call Return With Last Call Return find out who called even if they did not leave a message. To activate Last Call Return: * * 8 9 To retrieve the number of your last call, lift the handset and dial *69 (or dial 1169 on a rotary telephone). If the number is not blocked, you ll be given the phone number of the last call. If the number is blocked, you will not be able to receive the number. Note: This option does not work for calls received from a cellular phone. If you want to return the call, press 1 and the number will dial automatically for 30 minutes. If the line is busy, hang up and your phone will continue to dial the number for up to 30 minutes. When the line is no longer busy, your phone will ring distinctively. Pick up the handset and the call will connect. If you don t want your phone to continue to place the call, lift the handset and dial *89 (or dial 1189 on a rotary telephone) to cancel. 10 Three-Way Calling This feature allows you to add a third person to your conversation by simply dialing their phone number. It s ideal for business conference calls or for calling friends and family. To use Three-Way Calling: Press and release the flash key, link button or switchhook to put your first caller on hold. Listen for three brief beeps followed by the dial tone. Call the additional party. To connect all parties, press and release the flash key, link button or switchhook again. 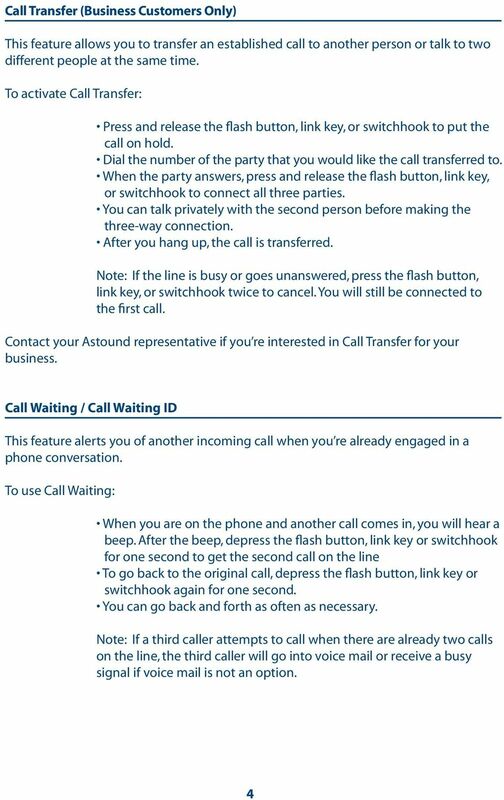 To disconnect the second call, press and release the flash key, link button or switchhook. You will still be connected to the first call. 2 Note: If the third party does not answer the phone, press the switchhook two times to cancel. You will still be connected to the first call. Voice Messaging Accessing Your Mail:* All of your voice messages will reside in your personal mailbox, which is protected by a pass code. 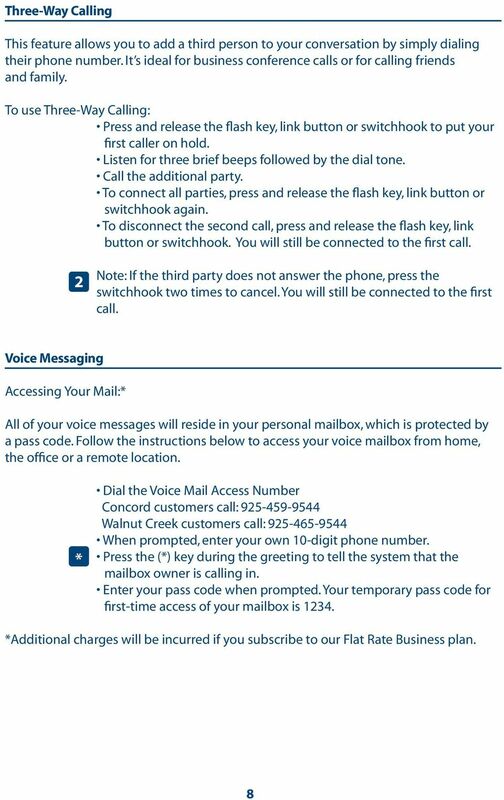 Follow the instructions below to access your voice mailbox from home, the office or a remote location. * Dial the Voice Mail Access Number Concord customers call: Walnut Creek customers call: When prompted, enter your own 10-digit phone number. 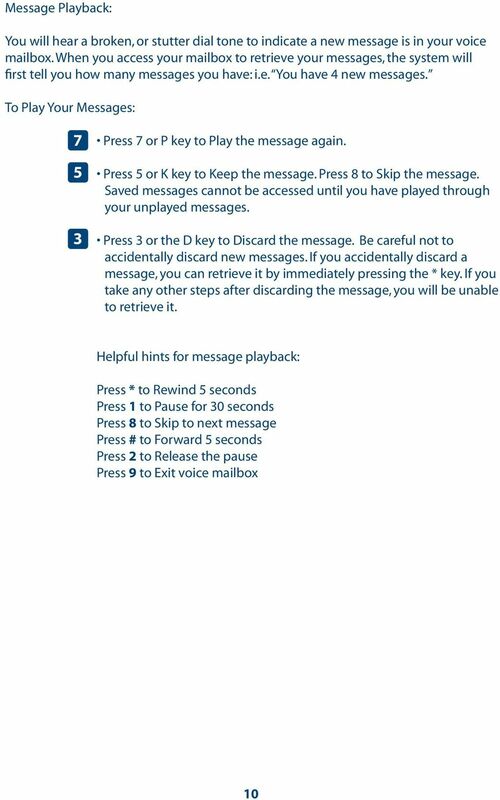 Press the (*) key during the greeting to tell the system that the mailbox owner is calling in. Enter your pass code when prompted. Your temporary pass code for first-time access of your mailbox is *Additional charges will be incurred if you subscribe to our Flat Rate Business plan. 11 Setting Up Your Mailbox: On your initial call to your mailbox you need to customize the mailbox options, such as your new permanent pass code, your name announcement and personal greeting. The system tutorial will guide you through the process. It is important to complete the entire tutorial. Create a New Pass Code You will always be prompted for your pass code before accessing your mail box. Your pass code number (from 4 to 10 digits) keeps your mailbox private and secure. Your temporary pass code is Record Your Name Your name announcement serves as a label for your mailbox. 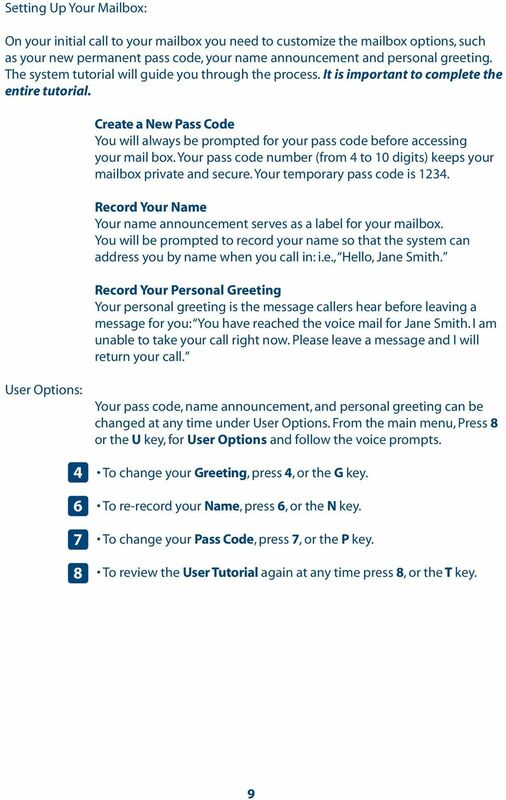 You will be prompted to record your name so that the system can address you by name when you call in: i.e., Hello, Jane Smith. 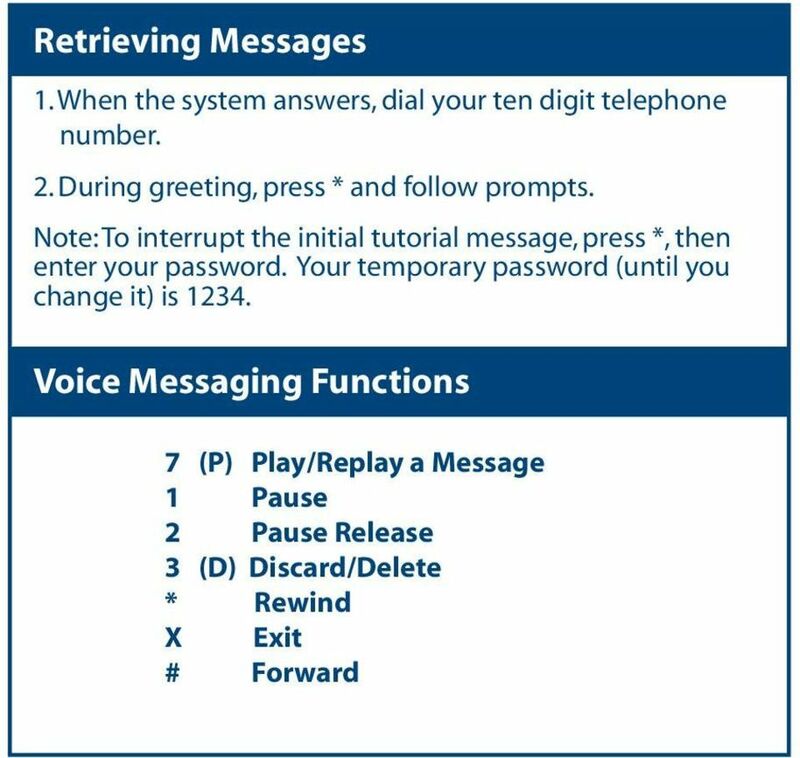 Record Your Personal Greeting Your personal greeting is the message callers hear before leaving a message for you: You have reached the voice mail for Jane Smith. I am unable to take your call right now. Please leave a message and I will return your call. User Options: Your pass code, name announcement, and personal greeting can be changed at any time under User Options. From the main menu, Press 8 or the U key, for User Options and follow the voice prompts. To change your Greeting, press 4, or the G key. To re-record your Name, press 6, or the N key. To change your Pass Code, press 7, or the P key. To review the User Tutorial again at any time press 8, or the T key.